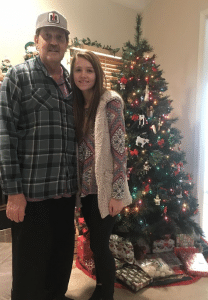 On December 12, 2017, Tara found out that her dad, Todd, was in end-stage renal failure and would need a kidney transplant. Tara immediately knew that she wanted to become his living donor. Todd hesitated to allow Tara to donate her kidney. However, she finally convinced him that it was safe for her to donate and they both went forward with the required blood tests. Soon after, they found out that Todd needed quadruple bypass surgery. After the surgery, it was confirmed that Tara was a match to donate. However, five days after the surgery, Todd needed an emergency blood transfusion. Three days later, due to the transfusion, Todd and Tara were told that they had to wait a month and get the comparability retested. When they went to get retested, they found out that Tara was no longer a match. “When my dad and I found out we were no longer a match it was very hard to accept. We already were a match and were planning the surgery and then next thing you know, we aren’t a match,” Tara said. The news was very discouraging for Todd and Tara. However, Tara was determined to save her father’s life. Todd was listed on multiple kidney paired donation lists and at multiple hospitals. Tara knew she would figure out a way to get him a kidney, even if she had to donate a kidney to a stranger. One day, Tara was scrolling through Facebook when a local story caught her eye. A 17-year-old boy who lived in their town needed a kidney transplant, and his parents were not matches. He had the same blood type as Tara. Tara called the transplant center and explained the situation. She told them that she would get tested to see if we were a match – if someone from his side got tested to be Todd’s donor. Eventually, they found out that Tara was a match for the teenage boy and his dad was a match for Todd. After 144 dialysis treatments, Todd received a kidney transplant on December 6, 2018. Todd felt better the minute he woke up from the operation. He now has his color back, more energy. and a different outlook on life. Tara, on the other hand, has had a more difficult recovery. Todd and Tara have not yet met the teenage boy and his family, but hope to meet them soon. Interested in sharing your story? Contact us! What a wonderful gift! Thanks for sharing. Ditto ! ……What strength and courage and perseverance and love has been exhibited by ALL involved …..PEACE !! !